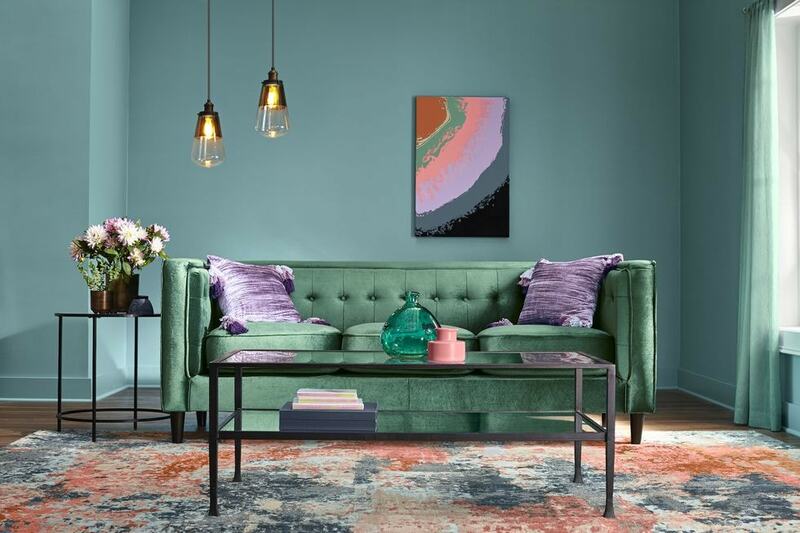 The world of interior design is heavily influenced by color trends and it makes perfect sense given how different hues can completely transform the look of any room. 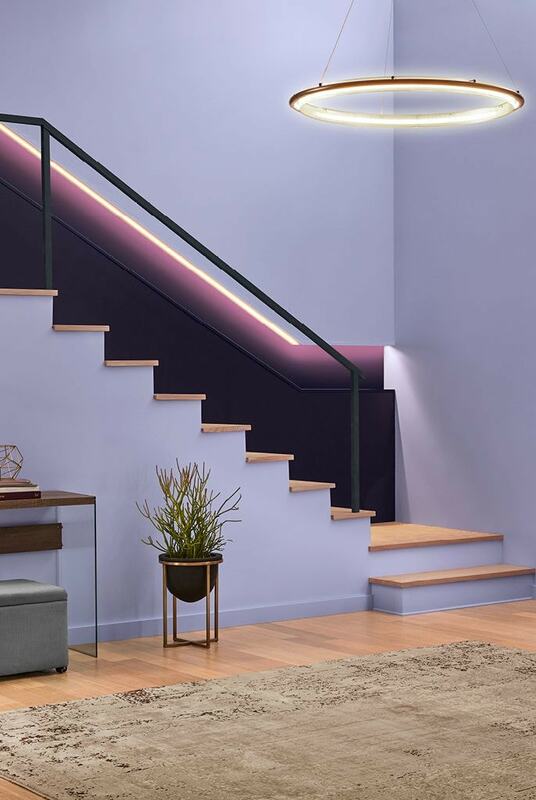 If you’re searching for the best color to redecorate in 2019, this article will help as it showcases the hottest current paint color trends. 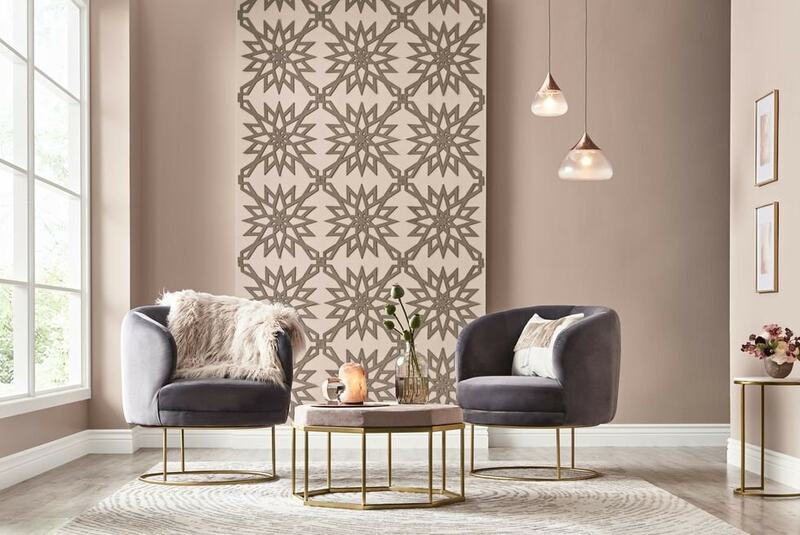 Whether you want to try out some bolder shades or wish to incorporate some more delicate colors, the following trends should offer you some inspiration. The color trends of last year were focused more on crafting an edgier color scheme with a healthy dose of neutrals. Lots of modern metallics and vibrant reds dominated, but this year it looks like the overall color vibes take a more mindful approach. We’ll analyze each color trend more closely and give you some helpful tips regarding how to incorporate these shades into your interior décor style. Living coral is the color of the year 2019 according to Pantone so it’s totally understandable for it to be featured here. This orange-pink shade has some energizing qualities that make it suitable for areas where you wish to bring in a more hopeful and optimistic vibe. If you’re looking to redesign a room with a hot color trend, you should definitely try out coral. There’s no need to stick to plain living coral as you can try some interesting combinations of orange and pink shades to uplift the room. The office shown here has no windows, but it makes up for this by incorporating creative pink and orange stripes on the walls that keep going upwards decorating the ceiling as well. The classic forest green has many beloved characteristics given how it’s capable of bringing a lovely touch of natural beauty inside your home. A modern take on this shade focuses on balancing the color so it doesn’t feel too arboreal while still including the outdoors atmosphere. 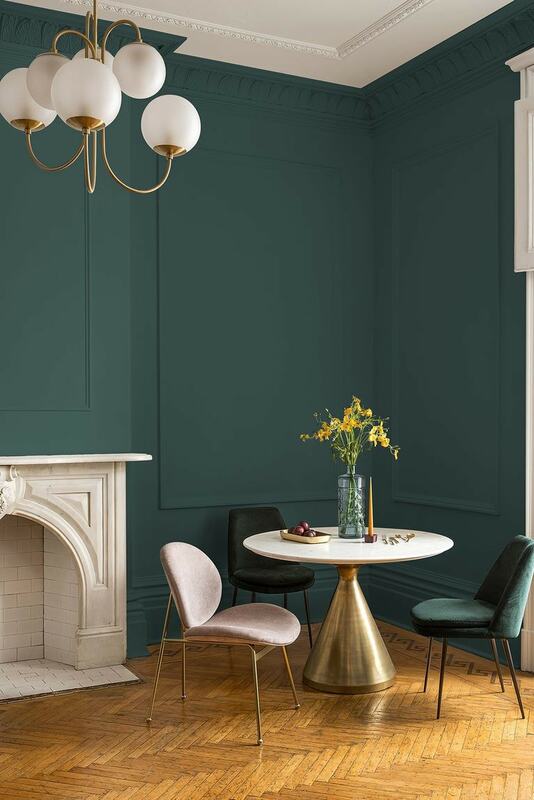 The result is a deep green that represents an excellent choice for furniture or painting the walls if you wish to add a sense of richness. Creamy neutrals have some timeless qualities so it makes sense to see them trending very often. White-washed rooms won’t be going out of style very soon and it’s recommended to embrace some warmer neutrals this year as opposed to the cool grays that were very popular in recent times. Warm whites dominate in this dining room offering a nice backdrop to show off some traditional decorations. 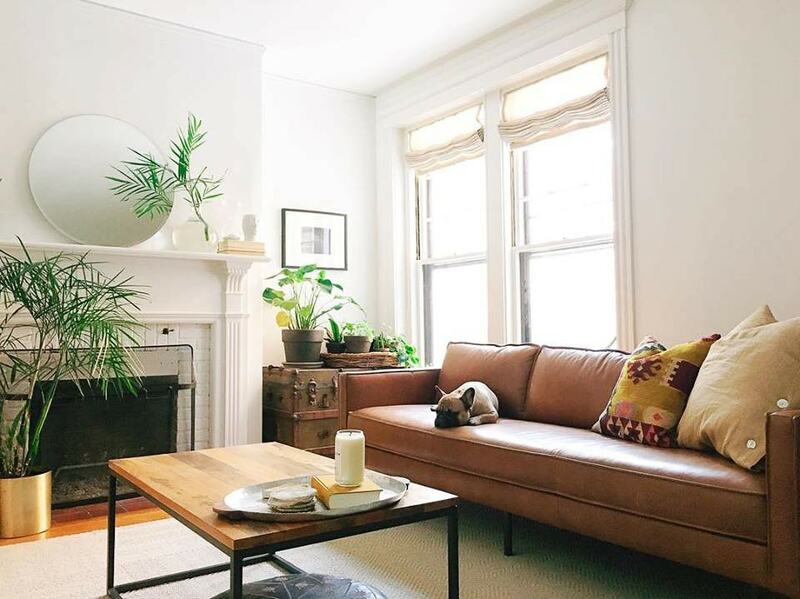 The warmer tone of a neutral color can add some depth to the room making it more inviting. This year it looks like the home décor trends start to move away from oversized botanicals and search for color inspiration by exploring woodland shades. In this living room, we can observe how the mushroom grays from the furniture get mixed with the warm browns of the ceiling and structural beams. The result is a very earthy look that delivers some naturalist vibes. If you’re looking to integrate some earthy hues such as beiges and browns while still retaining a cheerful atmosphere with a touch of elegance, then you should strongly consider soft clay colors. Any room decorated with colors such as terracotta and caramel will stand out compared to the regular neutral-toned design. Some more vibrant and unexpected clay colors can be successfully used if you plan on featuring a particular element of the room. 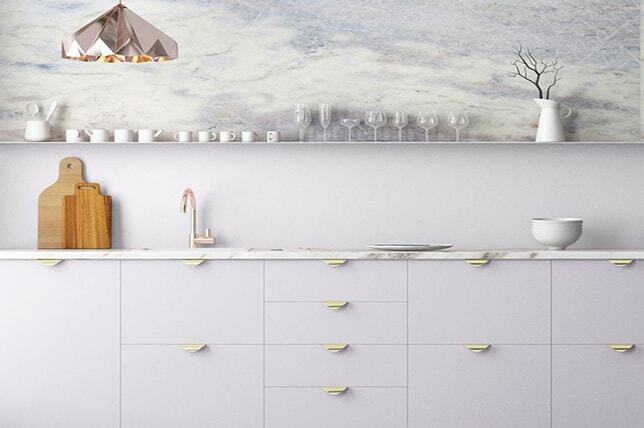 Whether you wish to make a bold statement with a kitchen backsplash or simply want to elevate the room with some burnt orange shades, soft clays are sure to enhance the look and benefit your mood. Many shades of pink will be trending in 2019 and one of the most important ones is this soft and calming shade. Blushing pink adds a chic personality to any room and can fit right in if you want to redesign your modern environment. Whether for sitting rooms or bedrooms, blushing pink is a trendy choice that you shouldn’t miss this year. One interesting trend that you will often see this year is the use of deep, saturated colors. 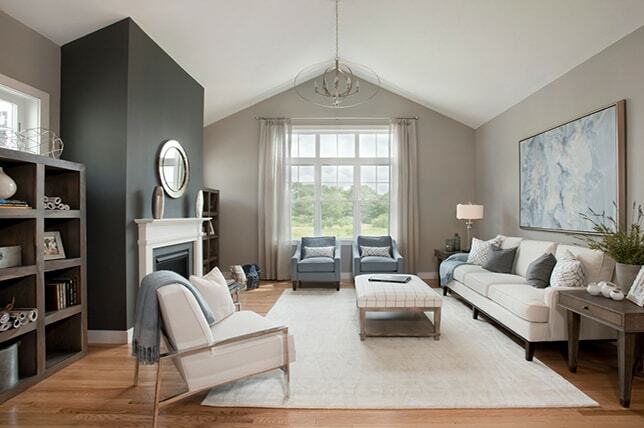 Many interior designers focus on boosting the saturation to create a moody impression. Dark colors that look more saturated can be used well regardless of the room, though kitchen cabinetry seems to benefit the most from this sense of richness, particularly if there’s plenty of natural light involved. Instead of increased saturation, some designers prefer going for a muted approach when playing with colors. A solid example is this blend of pastel green and blue that develops an ethereal quality when coupled with lilac and gray undertones. This combination is called mist and it’s not really considered a color. This trend is more like a non-color that gives you a great starting point to incorporate all kinds of décor colors and styles. 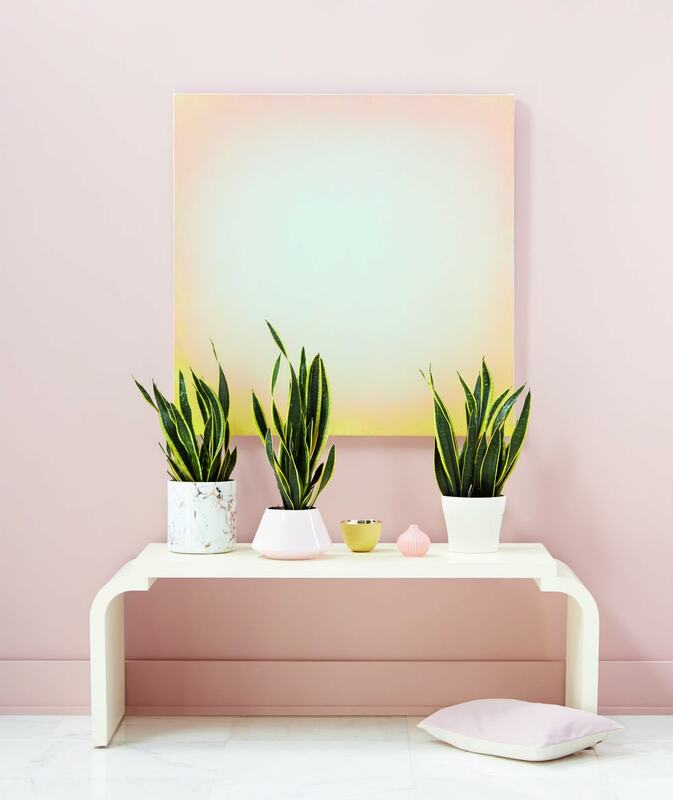 Misty hues work in a similar manner to classic neutrals such as whites and beiges, but there’s a pastel effect that brings some fresh vibes to the atmosphere. Fans of dark and moody interior décor will be delighted to know that this trend isn’t going anywhere this year. One excellent example is Hale Navy from Benjamin Moore which is a spectacular color to use for decorating the hallway or to paint the walls. 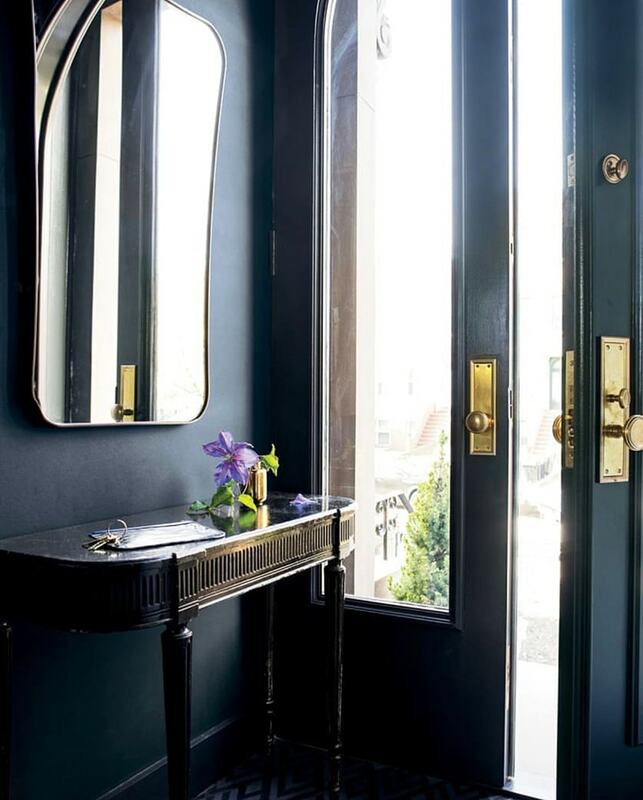 Although darker shades have the opposite effect in terms of openness compared to lighter shades, Hale Navy walls can look very exquisite and rich. This kind of look can be fitting for lots of areas in need of some extra personality. 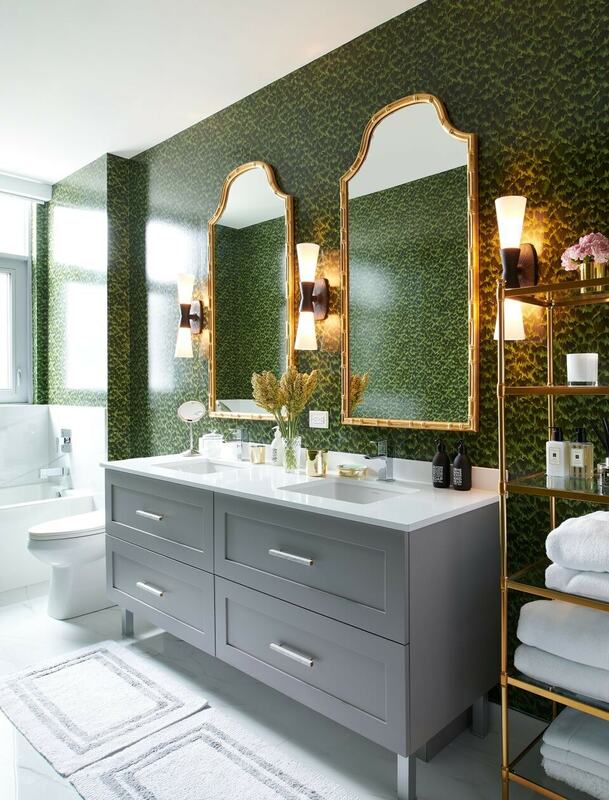 Some good examples include powder rooms and feature walls. Colors that contribute to a cheerful mood will see a rise in popularity this year. Optimistic yellows can create a lovely focal point in any room. 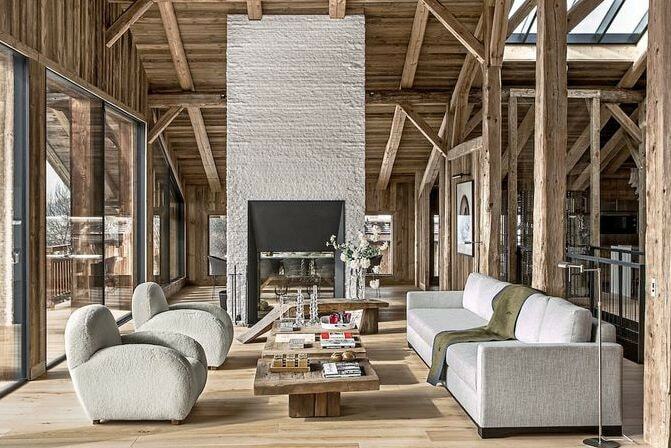 The key is to pair it with cool blues and stylish beiges to obtain a relaxing atmosphere. 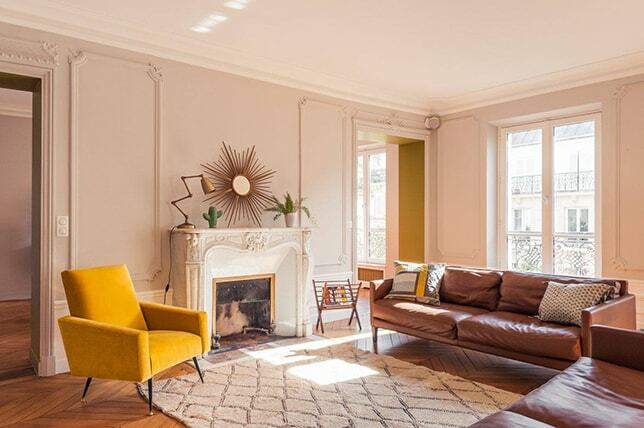 If you’re interested in crafting this kind of inviting ambiance in your home, one great example of interior paint color is this Afternoon Yellow from Sherwin-Williams. Dove gray has been a popular option for those searching to create that modern neutral look. This year we’re looking at lilac gray as a good candidate to become a trending color given its extra moodiness. This shade of gray has comparable neutral characteristics to similar hues, but it’s a bit warmer to craft a more cheerful impression. A room with lilac gray undertones is a refreshing alternative to options that provide too much of a stark neutral sensation. Lots of interior designers appreciate the ability of this color to be subtle enough yet not easily tiresome. The living room shown here seems to come alive thanks to the warmth of the lilac hues without breaking the minimal feel. 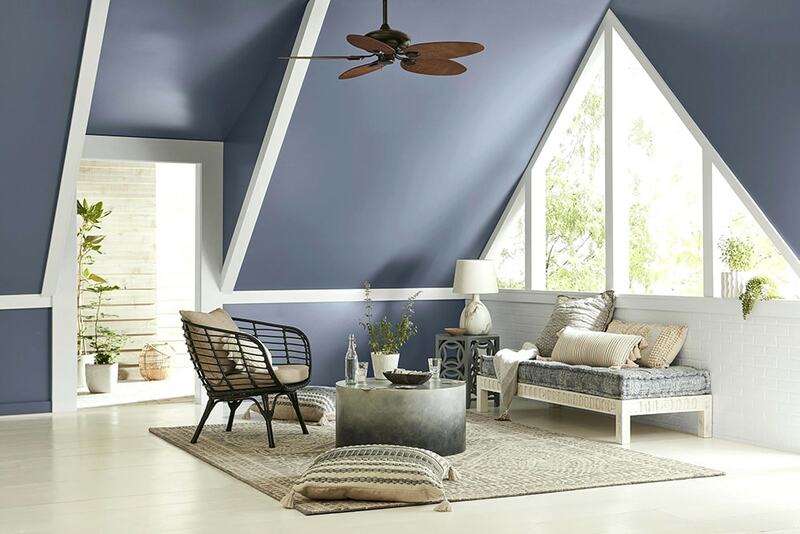 Valspar’s Seattle Haze offers a sophisticated mix of blue and gray crafting a delicate purple tone. Even when it’s used on the walls and the ceiling, this rich color doesn’t feel that overpowering. This sitting room takes advantage of Seattle Haze delivering a soothing atmosphere thanks to the increased amount of natural light. It looks like this year we’ll be seeing a lot more purple-toned grays for more refined design schemes. Thanks to their convenient ability to blend with other shades, pale pinks are having a very popular time this year. You can use pale pink as a delicate neutral backdrop where you can show off your style with bolder shades. 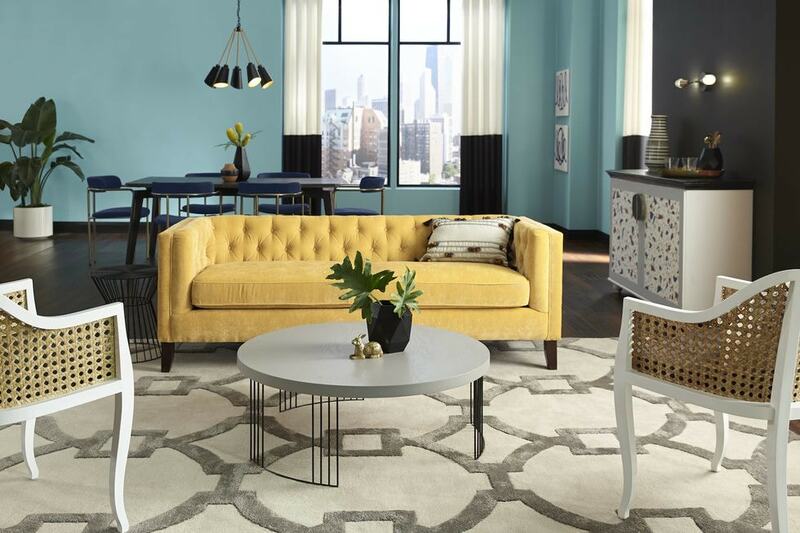 One color that mixes well with this hue is lemon yellow which adds a zesty feeling to the look. Whites will also blend nicely for a lovely feminine impression. Creamy shades of hazelnut colors have some warm and comforting qualities that make them ideal for any living room. This is a great color trend to try if you’re searching for some subtle neutral tones that won’t clash easily with your existing furnishings. If the room that needs a redesign has limited space, you can use creamy hazelnut colors to your advantage. By combining these shades with large windows, you will be able to create a brighter room that will seem larger than it is. One of the best colors to choose this year is Hunter Green. It’s not hard to see why this shade is trending given its timeless quality and beautiful blend of natural style with neutral vibes. 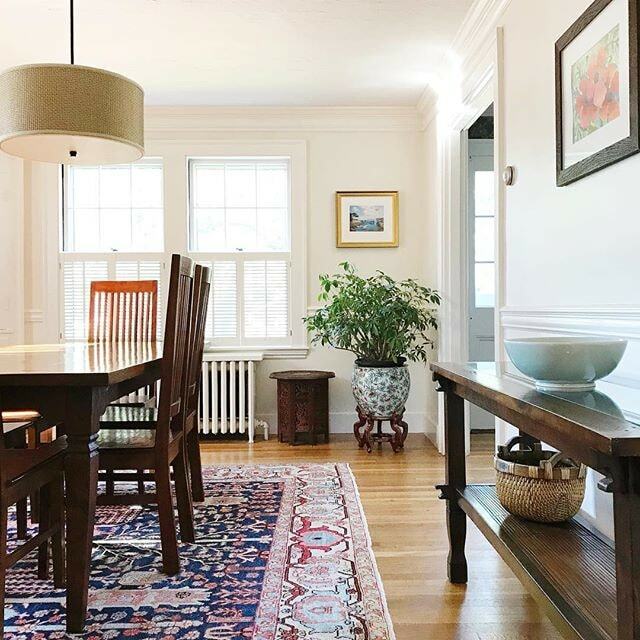 Some interior designers appreciate it for its worldly value and the surprisingly seamless transition it can make even when the color is used for painting the walls. Benjamin’s Moore Hunter Green could be an excellent choice for the bathroom considering its gender neutrality. When used correctly, any room should feel nicely balanced without giving off stronger vibes of either masculinity or feminity. Some pastel derivates will work very well for common areas such as bathrooms or kitchens. Chalky tones give off some understated vibes that provide the ideal backdrop for minimalist design. Instead of using stark white shades, chalky pastels will seem warmer and a better fit for a minimal look. This kitchen features a dramatic marble backsplash and there are chalky pastel tones throughout to contribute to a memorable design. Go for this style if you don’t feel ready to commit to bolder color trends. Focus on glittery accents like the gold and copper elements here. 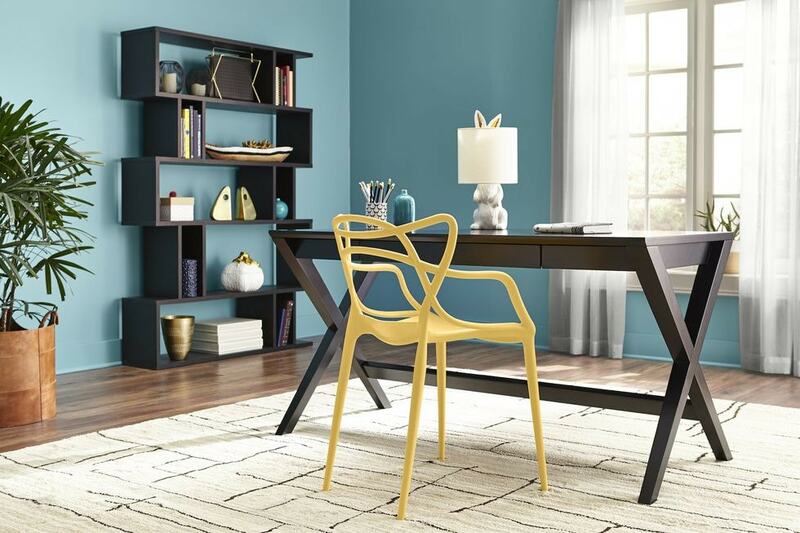 Behr’s Blueprint is an interesting color trend that seems to have a very balanced brightness. This makes it a versatile option to incorporate with lots of design styles. The rich denim blue feels mature and modern allowing you to add it to multiple rooms for a superb splash of color. You can integrate the Behr Blueprint quite nicely in a sophisticated bathroom that also has some casual vibes. 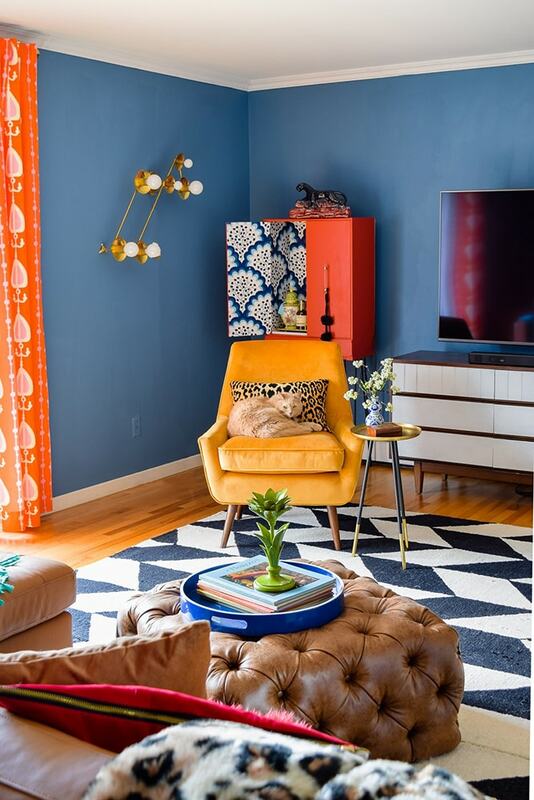 Another great use for this shade of medium blue is to craft a more eclectic-looking living room. Take a look at this picture and notice how Blueprint blends so elegantly with other bold colors to personalize the room. Valspar’s list of trending colors has another interesting shade to consider. 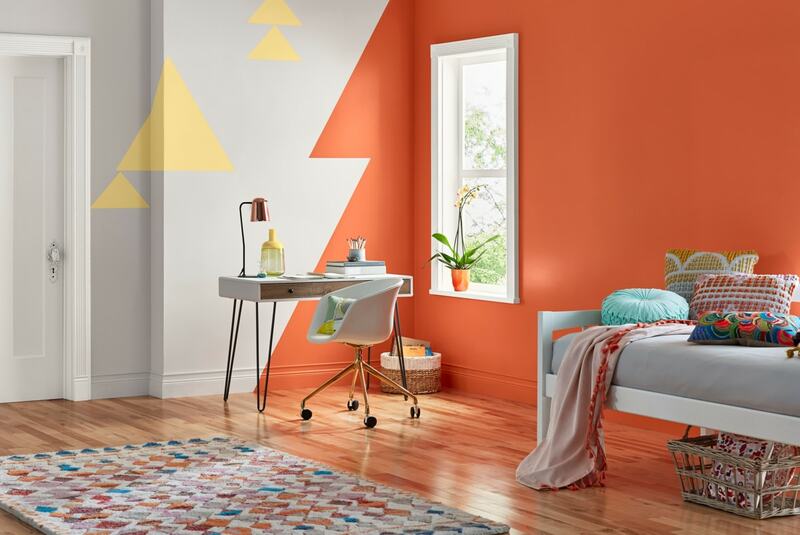 Orange Slice is a playful hue that’s perfect for making a statement in any room. It’s not difficult for this bright orange color to capture all the attention and take center stage with its boldness. This year is all about experimenting with more adventurous colors so Orange Slice could be a fitting choice. We recommend this tone for brightening up a living room or to add some excitement to a kid’s playroom. Clean stark whites experienced a solid level of popularity in recent years. That doesn’t mean it’s time to abandon them in 2019. 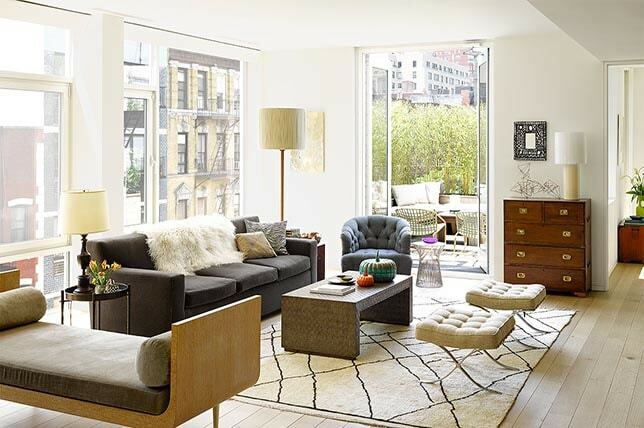 Making a room seem brighter and more inviting can be done most effectively with the help of crispy shades of white. Benjamin Moore’s Super White looks like a great paint color for the living room that benefits from considerable amounts of natural light. While warm whites are suitable for certain environments, those looking to maximize the openness of a room should stick to cool whites that bring in some powerful light reflecting properties. 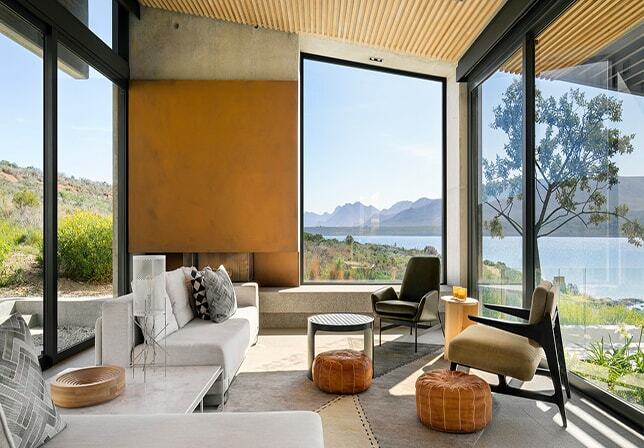 Modern interior design in 2019 has a tendency to draw inspiration from the digital world of smart technology. 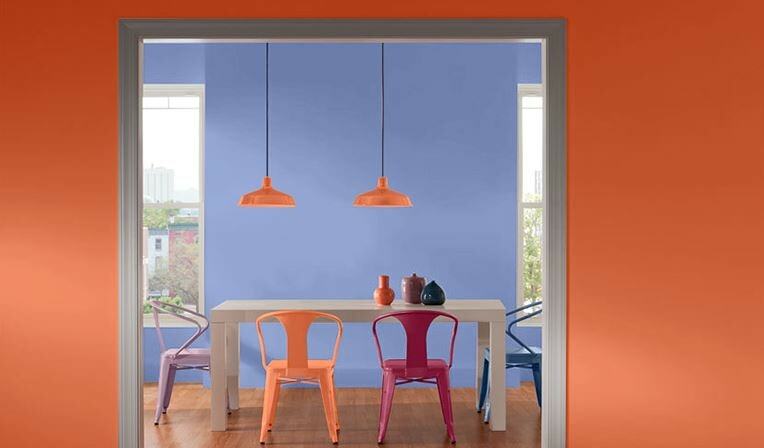 High-intensity shades like Twilight Mist from Valspar could be very suitable if you wish to create a striking look. It works very nicely with modern lighting fixtures that show off some sophisticated edges of artificial light. A solid alternative to gold, deep mustard can look gorgeous in all kinds of interior décor styles including bohemian and retro. It adds a brilliant pop of color and that makes it suitable as an accent color or rich focal point. Deep mustard hues will provide a moody effect to the entire look allowing you to highlight other décor pieces more effectively. 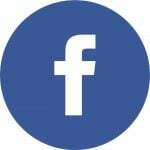 It’s recommended to use this color sparingly as its depth can feel overwhelming in larger doses. The marriage between gray and beige results in a stunning pewter color that could be a great choice for those who don’t like all-white walls. This is one of the best paint colors for this year and you shouldn’t underestimate its ability to act as a stylish canvas where you can add other décor elements. Lots of interior designers like the way the pewter color works surprisingly well with virtually anything regardless of the room you choose for a makeover. In fact, it’s a good idea to take this pleasant shade throughout the home instead of restricting it to only one room. While 2018 was dominated by neutrals, this year favors more adventurous doses of color. 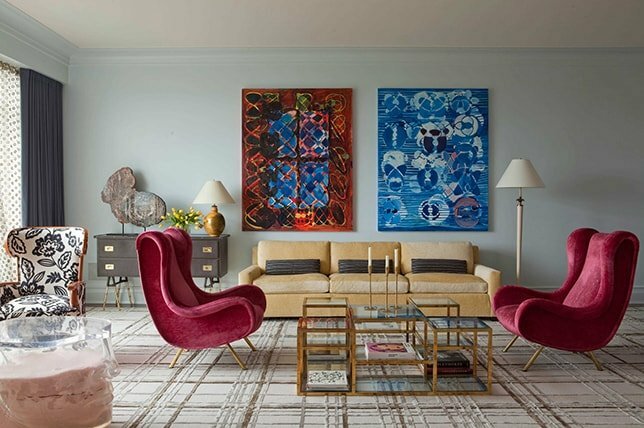 Make a sitting room more lively with the help of jewel-toned furniture and accents. Various colors resembling emeralds and sapphires are trending when it comes to decorating your kitchen cabinets or accent walls. It’s up to you to find the right balance of mystic vibes. Another playful color that you can successfully incorporate in your 2019 makeover is electric citrus. This shade of green has a bold attitude that can revitalize any room. 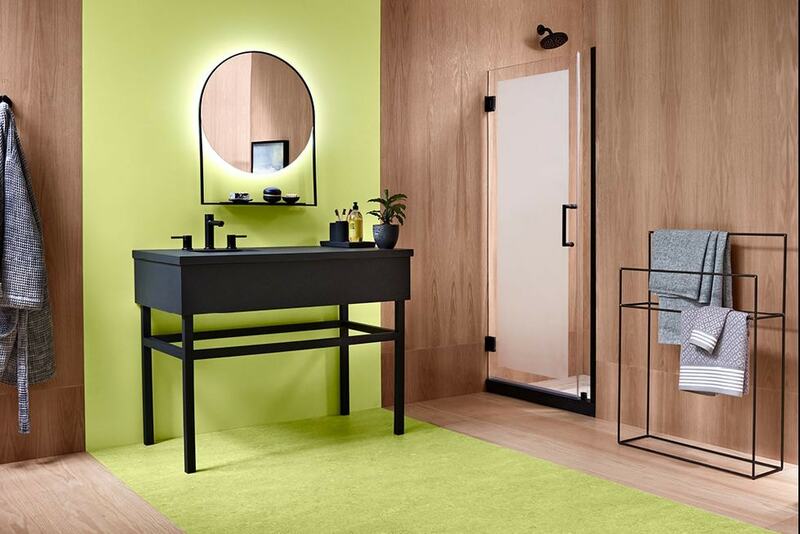 A similar effect can be obtained with other energizing colors like citrus orange and bright yellow, but this lime tone takes center stage among vibrant color trends of this year. If you’re more of a traditionalist and prefer colors that won’t take over the room, perhaps choosing subtle shades of blue represents a smart idea. 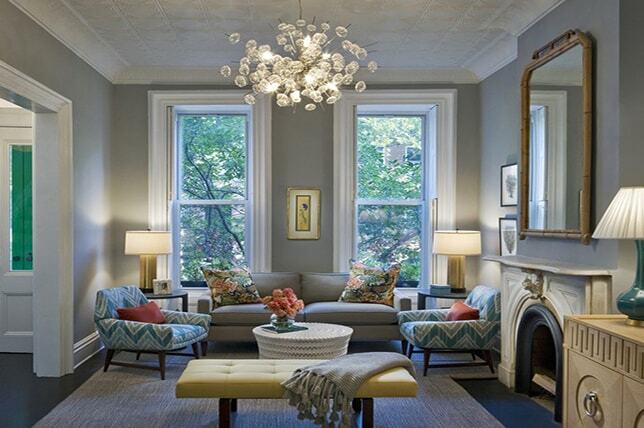 Combine different hues such as charcoal blue and ice blue as well as pale shades that have some delicate qualities. There’s an endless selection of alternative blue paint color ideas you can try to decorate a room. The calming effect of blue is stronger if you opt for soothing and spare shades instead of intense hues. 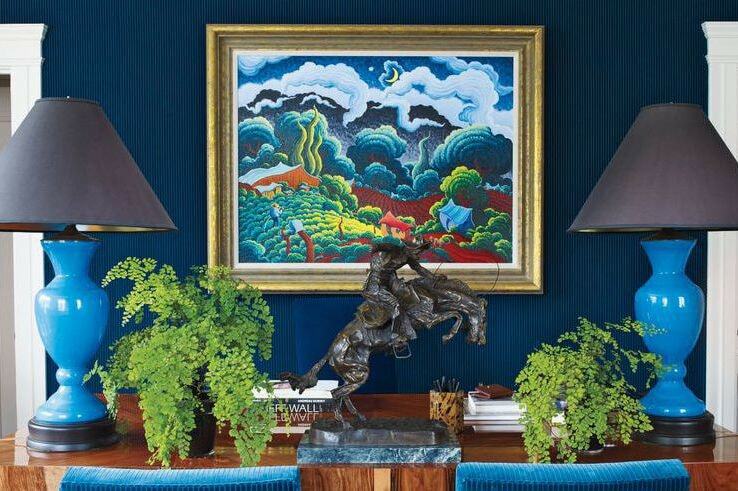 If you like some darker navy or turquoise, it’s better to combine them with some muted blues to balance their impact. 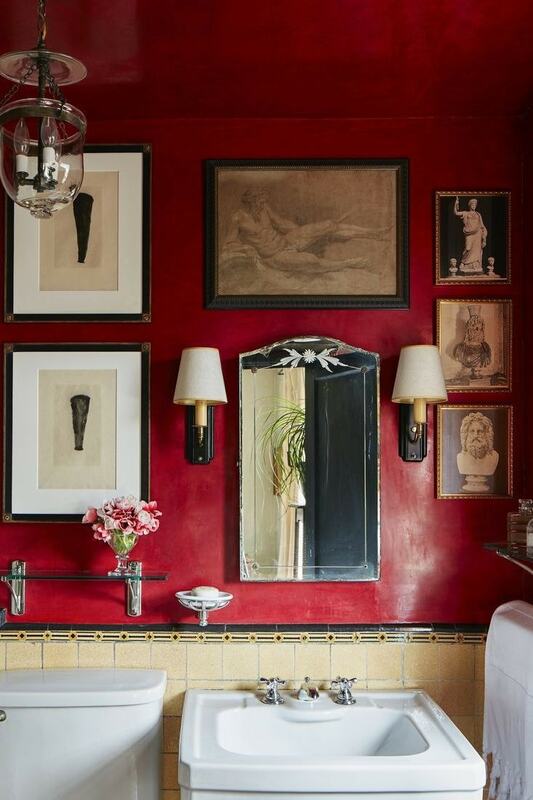 If you wish to breathe some new life in a bathroom, going for highly saturated shades of red could be a great choice. These Deep Berry hues can make any space cozier while retaining a sense of playful energy. This is a rich color that can add a great personality to a room without overwhelming it. It’s an excellent example of trending color for 2019 as this saturated red is bold and comforting at the same time. There are lots of vivid shades of blue, but few can retain this sense of tranquility like this aqua hue from Sherwin Williams. It’s called Reflecting Pool and it can stand on its own or get combined with other colors for a unique impression. Go for some muted pastels or soft pinks to highlight the beautiful look of this vibrant aqua shade. Even though it’s not hard to tone down this color, Reflecting Pool has the ability to draw the attention in a room in an effortless manner. It’s an excellent choice for a bookshelf in your home library or a fun accent wall.